PRO-V MODEL M23 INSERTION FLOWMETERS are available in four configurations: M23-VTP offers you flow computer functionality in a compact field device, delivering outputs for totalized mass and alarm settings, and up to three analog 4-20 mA outputs of five process measurements, including volumetric flow rate, mass flow rate, pressure, temperature and density. M23-VT integrates a precision 1000 Ohm platinum RTD temperature sensor that can be used to calculate and output a compensated mass reading. This device is typically used to measure flow rates of saturated steam. M23-V delivers a direct reading of volumetric flow rate, generally considered the most cost-effective solution for liquid flow monitoring. M23-EM, the Pro-V Energy Monitoring option permits real-time calculation of energy consumption for a facility or process. The meter can be programmed to measure steam, hot water or chilled water. PRO-V MODEL M22 INLINE FLOWMETERS are available in four configurations: M22-VTP offers you flow computer functionality in a compact field device, delivering outputs for totalized mass and alarm settings, and up to three analog 4-20 mA outputs of five process measurements, including volumetric flow rate, mass flow rate, pressure, temperature and density. M22-VT integrates a precision 1000 Ohm platinum RTD temperature sensor that can be used to calculate and output a compensated mass reading. This device is typically used to measure flow rates of saturated steam. M22-V delivers a direct reading of volumetric flow rate, generally considered the most cost-effective solution for liquid flow monitoring. M22-EM, the Pro-V Energy Monitoring option permits real-time calculation of energy consumption for a facility or process. The meter can be programmed to measure steam, hot water or chilled water. 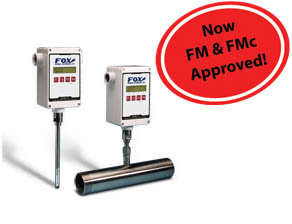 The FOX Model FT2 provides a direct mass flow measurement of air and gases in SCFM, NM3H, Kg/Hr, and other mass units. Two isolated 4-20 mA outputs for flow and temperature, and one pulse output for flow are standard. The FT2 is ideal for measuring low velocity flow rates and offer a wide measurement range; typically 100:1. The FOX Model 10A is available in both inline and insertion-type configurations and suitable for harsh and hazardous applications. The instrument offers a 4-20 mA output in your choice of engineering units, and the on-board display and configuration panel provides a bright LED read out of flow rate and totalized flow. All wetted parts are 316 stainless steel, with Hastelloy C276 optional.